Pergo Platinum Series XP Coffee Hand-scraped Hickory offers an ultra-realistic wood grain finish with premium attached underlayment and PermaMax surface protection for double the wear, double the durability of ordinary laminates. ScratchGuard Advanced provides superior scratch and scuff protection. XP is an AC4 rated product, approved for general commercial traffic; suitable for your home, office or other light commercial applications such as boutiques and hotel rooms. This rating was designated after being tested for resistance to abrasion, impact, staining and cigarette burns. Each plank is 12 mm thick with a 2 mm attached underlayment and 7-1/2 in. wide x 47-1/2 in. long. Easy to install, patented Uniclic joint for a quick and secure installation. Our limited lifetime residential and 7 year light commercial warranty guarantees the floor will not wear, stain or fade. High style made simple. There's only one Pergo. Wear claim compared to standard AC3 laminate flooring and measured in accordance with NALFA/ANSI LF-01-2011 and/or EN13329:2006+A1:2008. 12.03 sq. ft. per case; 360.9 sq. ft. per pallet. Case quantity: 7; pallet quantity: 30. Case weight: 26.4 lb. 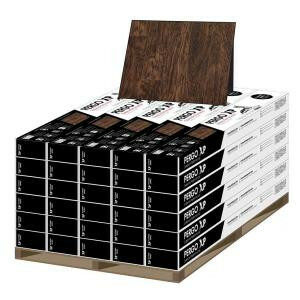 Buy online Pergo XP Coffee Handscraped Hickory 12 mm Thick x 5-1/4 in. Wide x 47-1/4 in. Length Laminate Flooring (360.9 sq. ft./pallet) LF000749, leave review and share Your friends.